Barbados Olympic Association Inc. hosts peaceful youth rally – Barbados Olympic Association Inc. The Barbados Olympic Association Inc. (BOA) hosted its annual International Day of Sport for Development and Peace (IDSDP) on Sunday 9th April at Gall Hill Playing Field in St. John. This year’s IDSDP event saw local sports teams come together to participate in a multi-sport youth rally which included basketball, dominoes, football, netball, and road tennis. With the support of UNICEF and the U.S. Embassy in Barbados, the event was used as a platform to highlight the role of sport to strengthen the sense of unity amongst our nation’s communities. In his opening remarks, BOA Secretary General Erskine Simmons spoke about the significance of the IDSDP and the value of sports to foster peace and development. “The primary concept of Olympism is to use sport to create a more peaceful and developed world. Today’s activities bring together a large number of our nation’s young people in a way that embodies this philosophy and spreads a message of peace throughout entire communities,” he said. Her Excellency Linda Taglialatela, Ambassador of the United States of America, also drew attention to the importance of the development of youth through sports, announcing plans for a series of community sports and educational programs to be held in collaboration with the BOA all throughout this year. “Today is especially significant in highlighting peaceful play, camaraderie, team building and true sportsmanship, and is a wonderful launch to a series of similar events to be hosted island-wide. The U.S. Embassy and the BOA’s missions dovetail well, making this a natural partnership that I hope will continue for many years,” she said. Parliamentary Representative for St. John, Mara Thompson, thanked all who were instrumental in organising the event and for bringing it to the parish of St. John, before officially declaring the tournament open. 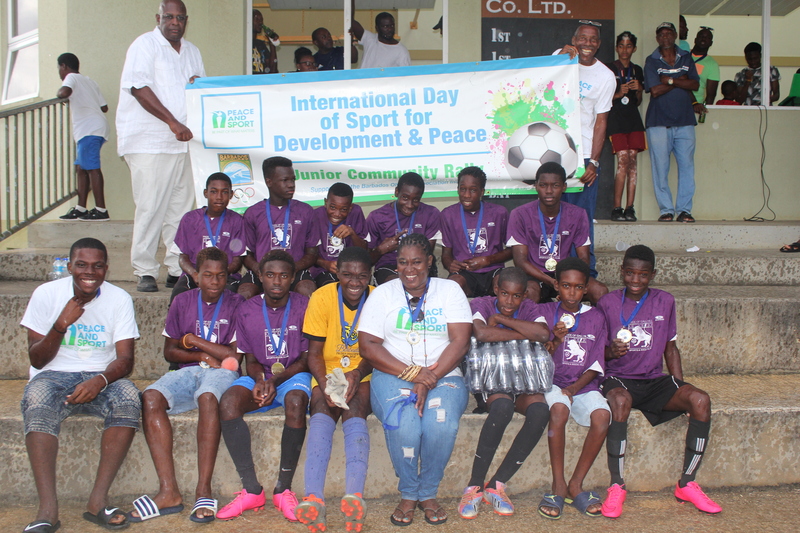 Tricia Browne from the winning football team, Pride of Gall Hill Football Club, said she fully supported the initiative and was glad to see everyone enjoying a day of sports in the name of peace. “This is a great idea to bring the communities together and I welcome it anytime because it is for a very good cause – sports and peace. It also helps young people to grow and develop in terms of discipline, while having fun at the same time,” she said. Food and drink were on sale by local vendors, alongside jumping tents, and a local DJ playing music all day. Youth development organisation A Ganar Barbados were also on hand providing motivational group discussions, as well as the National Anti-Doping Commission (NADC) who were handing out information to all players and participants about the dangers of doping in sports. The IDSDP is an annual celebration of the power of sport to drive social change, community development, and foster peace and understanding. The United Nations (UN) General Assembly declared 6th April as the IDSDP in 2013, and it has been celebrated annually since 2014. The IOC is supportive of this initiative, recognising the role of sports organisations to support social change and human development. Winning football team, Pride of Gall Hill, braved the rain to celebrate their victory.